The biggest news for iOS and OS X was definitely the unveiling of Swift, but in addition to that, Cocoa Touch received a major update. As a result, some of the old APIs are being removed in order to make way for the many new additions to the framework. Starting from iOS8, UIActionSheet and UIAlertView are being replaced by the new UIAlertController. An instance of the UIAlertController can be presented modally on screen just as any other UIViewController using the presentViewController:animated:completion: method. What makes the UIAlertController instance differentiate between working as an ActionSheet or as an AlertView is the style parameter you pass when creating it. If you have used a UIActionSheet or UIAlertView, you know that the way to get a callback from it is for a class (in most cases the ViewController) to implement the UIActionSheetDelegate or UIAlertViewDelegate protocol. There are some open source projects that replaced this delegation pattern with block based callbacks, but the official APIs were never updated. UIAlertController does not use delegation. Instead, it has a collection of UIAlertAction items, that use closures (or blocks if you are using Objective-C) to handle user input. In order to try out UIActionController, just create a new Single View Swift Xcode project. Add two buttons to the screen and connect actions to them. 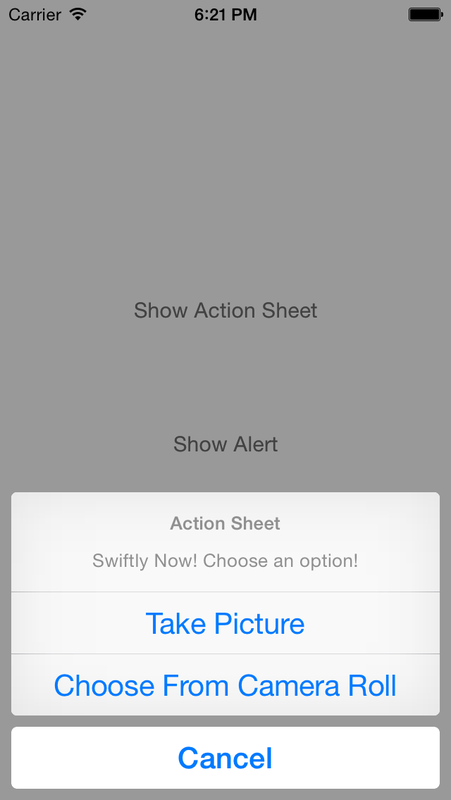 Let’s start off with the action sheet example. We will create an instance of UIAlertController and add three actions to it - Cancel, Take Picture and Choose From Camera Roll. 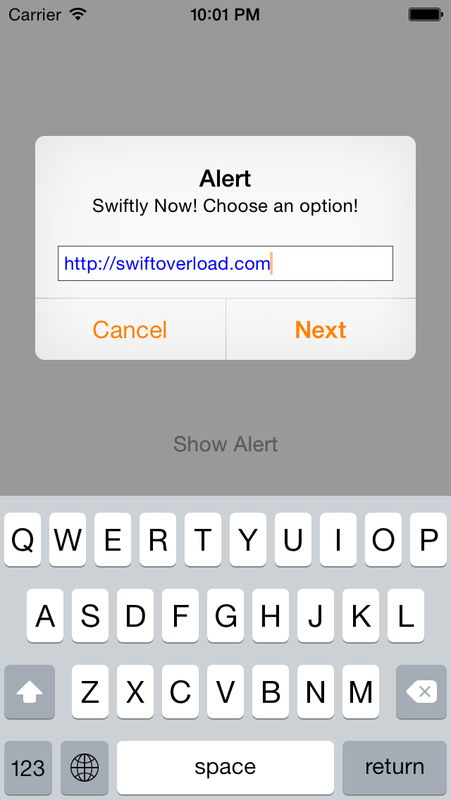 And now for the alert view example. The code is pretty much the same (which is great! ), except for the .Alert value for the style parameter and the fact that we can add UITextField components to the alert view. We have a designated closure parameter that lets us customize the text input field. The new way of presenting action sheets and alerts makes your code much more flexible and compact. It also gives you more ways to customize your UI. The UIAlertController API is an example of how Apple motivates developers to address different devices and use cases with one universal codebase. Right now, the styles that we can choose from are only .ActionSheet and .Alert, but in future versions of the iOS SDK, we may have more options. You can find the project with the sample code here.